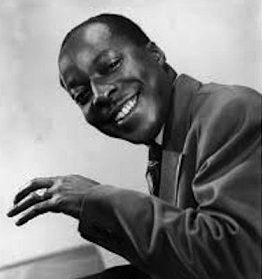 Though his rock output was sporadic and only occasionally vital, Gant’s role in proving the commercial possibilities of black music for independent record companies in the mid-1940’s ensured that subsequent styles such as rock had an outlet to reach the public. Cecil Gant was born in 1913 in Nashville, Tennessee and it was while in the Army during World War Two that he rose to sudden fame after asking to sing and play piano at a War Bond rally in Los Angeles. His performance caused quite a stir and as a result he began making appearances at rallies all over the city and was quickly was signed to a small record company called Gilt-Edge who issued his tender ballad “I Wonder” which expressed the sentiments of soldiers overseas perfectly. Despite being on such a weak label the record became a sensation, topping the Race charts and remaining in the Top Ten for a startling twenty-eight weeks. The record’s profound success helped inspire countless others to see the potential of the independent record industry and dozens of labels sprang up in its aftermath, most of which followed suit by focusing on the black styles of music otherwise neglected by the major companies at the time. The result of which when rock ‘n’ roll was born three years later in 1947 it had a small but thriving community of independent record companies and distributors to see to it that the music had the means to be sold. As for Gant though his popularity had come from his mellow crooning he was also a fine boogie piano player who often coupled storming uptempo instrumental showcases alongside slower material. After rock’s arrival on the scene Gant naturally adapted this side of his musical persona to fit that genre’s needs without ever fully committing to it as his primary direction, choosing instead to cut songs in all conceivable styles, his versatility being both an asset in guaranteeing he’d be capable of handling any material required, yet also a detriment as he never established himself in any one field. Additionally Gant’s personal problems made him rather difficult to deal with, not so much personally as professionally. He rarely could perform a song the same way twice, had little use for carefully working material out in advance and jumped from record label to record label, doing one-off sessions for cash with no eye on building a long-term career, including releasing songs under an alias which didn’t help keep his own name in the spotlight. On top of it all he was also an alcoholic inflicted with health problems that made his live appearances a risky bet for promoters. Yet even while he charted only occasionally in the years to come companies still were willing to take chances on him because of his lingering renown from his breakthrough that all but guaranteed his records would sell fairly consistently if not overwhelmingly. His other role in helping rock get off the ground was indirect, but notable, as it was Gant who listened to Roy Brown sing “Good Rocking Tonight” after Wynonie Harris had rejected the youngster pitching the song to him in New Orleans hoping to get Harris to record it. Gant was so impressed he phoned the president of DeLuxe Records in the middle of the night to have Brown sing it to him and the result was Roy got singed, the record got cut and launched rock ‘n’ roll in the process. Cecil Gant wouldn’t be around for very long to see the music evolve into the most dominant form of music of the 20th Century, as he died of pneumonia in 1951.